There’s not a lot to it. I’ve gotten to know quite a few folks in the WH & Obama campaign team over the years and it was always something I brought up when I got the chance. There are quite a few redditors at 1600 Pennsylvania Ave and at the campaign HQ — given the prominence of reddit, it’s an easy sell. I’ve met Alexis and that’s really how he is, but there has to be more to it than that. Read the rest of Peter’s article for the answer (hint: nope that’s really it). What’s the recipe for the White House’s beer? Redditor: This may be the most appropriate use of this meme in reddit’s history. Who’s your favourite Basketball player? Obama: Jordan – I’m a Bulls guy. For a complete listing of the session visit Alex Howard’s rundown on Google Plus. Even if you have only a passing familiarity with the massive multiplayer online game World of Warcraft, you’re probably aware of “Leeroy Jenkins,” a comedy sketch/meme/recreation of real events about an oblivious player who dooms his teammates charging into a battle (video here, watch this first if you’ve never seen it). For the CFC Worldwide Short Film Festival, director Finn O’Hara and advertising agency doug & serge recast Leeroy’s ill-fated battle with dragons as a sleek, taut heist thriller about a bank robbery. Clever stuff. Ever been RickRoll’d by telegram? In what was quite certainly one of yesterday’s more complicated (sophisticated?) 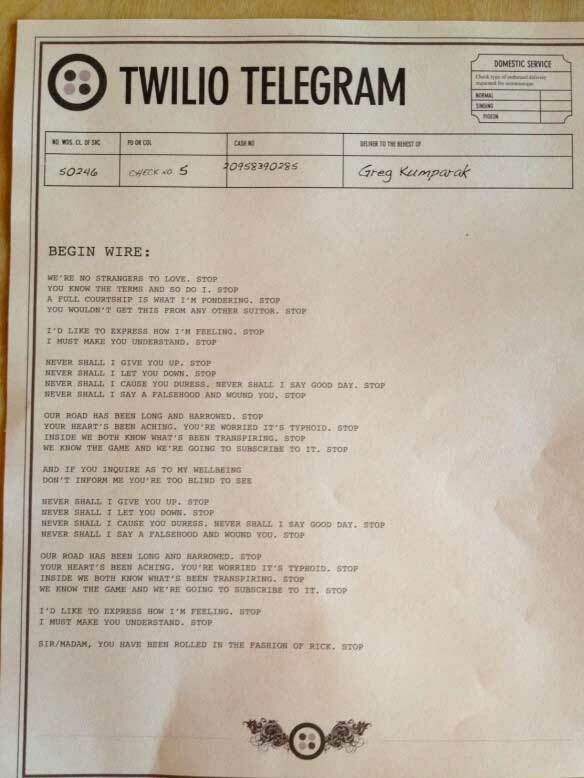 April Fool’s gags, the folks at Twilio rolled out an actual API… for telegrams. Built in the same spirit as their drop-in telephony services, the Telegram API lets any third-party developer add hand-delivered, TaskRabbit-powered telegram functionality to their applications. I was curious as to whether or not the telegrams really got sent, and the Twilio-team found the perfect way to prove it: old-timey Rick Astley, hand delivered. Never Shall I Cause You Duress. Never Shall I Say Good Day. Stop. Never Shall I Say A Falsehood And Wound You. Stop. Posted on April 8, 2012 Author robotchampionCategories defaultTags meme, music video, never gonna give you up, rick astley, rickroll, taskrabbit, telegram, twilio, video, viralLeave a comment on Ever been RickRoll’d by telegram? Episode 103: Jacques helps his daughter Claudine relinquish her fear of making pastry with his easy Tartelettes Aux Fruit Panaches. 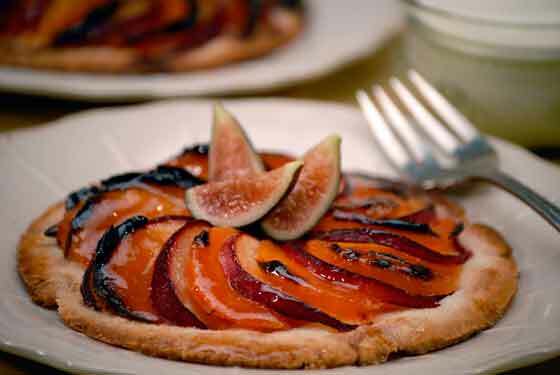 She goes on to assist her father in the kitchen as he makes his variation of the very traditional French, Tarte Tatin. Jacques then shares his mother’s recipe for Mémé’s Apple Tart using an unusual method to make the pastry. Finally his granddaughter Shorey joins him to make and taste Individual Chocolate Nut Pies. My favorite is the Tartalettes Aux Fruit Panaches - Thin disks of dough baked with a topping of lightly sugared apricot and plum wedges until the pastry is crisp and the fruit soft.